Achieving health equity by innovating new financing and stewardship models. We’re excited to launch our Fast Facts and Jargon Buster Series with the Build Healthy Places Network that will highlight key concepts from our initial research. Explore our postings as we share knowledge and demystify jargon in an effort to strengthen the connection between the worlds of community development and health. We already know that ZIP code is the single greatest predictor of an individual’s health. A few miles can shorten life expectancy by as much as 20 years. ZIP codes reflect the realities of daily living conditions that can create—or limit—opportunities to be healthy. Just as many factors contribute to these health discrepancies, it takes many partners to come together to work to achieve health equity. Newfound collaborations between community development and health partners offer an exciting opportunity to jointly improve community health. Recognizing that health cannot be achieved or maintained in isolation, Bridging for Health: Improving Community Health Through Innovations in Financing takes a systemic approach to improving population health, much in the same way that the Build Healthy Places Network tackles community development through cross-sector collaboration. Bridging for Health, supported by the Robert Wood Johnson Foundation, is aiding communities in the pursuit of financing mechanisms that rebalance and align investments in health. The Georgia Health Policy Center (GHPC) at Georgia State University in Atlanta is the national coordinating center. The center works with selected collaboratives across the country to improve population health and achieve equity. We believe that the key to this lies in the linkages among health care, public health, and other sectors like community development to support a national Culture of Health that will enable all to live longer, healthier lives now, and for generations to come. Bridging for Health initially selected four geographically diverse sites. The sites differ in the leadership of the collaborative and potential financing mechanism being explored, but share a commitment to upstream investment in interventions to improve population health outcomes in their community. We invite you to meet these four innovator communities and follow them on their journeys of Bridging for Health. Collaboratives cannot successfully implement a financing mechanism without the right partners, the right strategy, or without considering sustainability. GHPC’s 20-plus years of experience in health care financing, public health, technical assistance, and sustainability planning made us realize that it is shortsighted to focus financing innovations in isolation. While communities may be energized by the idea of pay for success or a wellness trust and are anxious to jump in, they must also address the areas that complement and support innovations in financing. Collaboratives cannot successfully implement a financing mechanism without the right partners, the right strategy, or without considering sustainability. Population health will never truly improve without an eye toward equity. Our team did a great amount of thinking about the need for a mindset change. How could we help our communities realize the importance of getting the pieces in place to nurture the innovation? 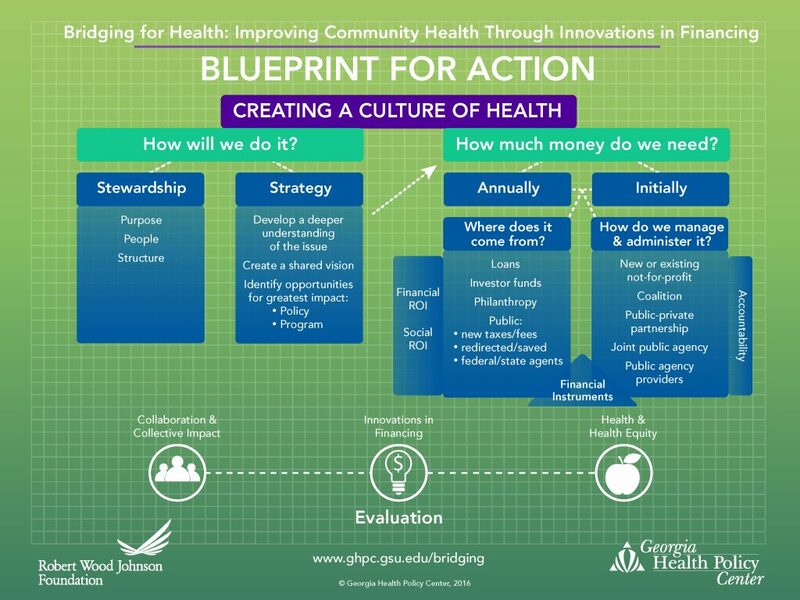 We have developed a framework, called the “Blueprint for Action.” This guides our focus on the core areas to address with our sites: collaboration and collective impact, innovations in financing, and health and health equity. Through tailored technical assistance, evaluation support, resources, subject matter experts, and opportunities for peer learning and exchange, Bridging for Health works with communities for two years to catalyze progress and share the learnings to spark further innovations across the country. We are excited to share what we are beginning to learn in each of the areas below. Align resources and community efforts through the collective impact framework to achieve meaningful and sustainable health improvement. Promote stewardship of a broad range of health related resources. Innovations in Financing –No health care organization brags about surplus money that is available for community improvement initiatives. In the pursuit of improved health outcomes and greater health equity, stakeholders must be creative in how to fund initiatives targeting the upstream drivers of health and wellness. Bridging for Health is aiding communities in developing and implementing financing mechanisms that rebalance and align investments in health. Innovations may include implementing a known financing innovation in a new setting, combining financing innovations in new ways, or creating new financing vehicles to meet local context. Some of the mechanisms being explored are capture and reinvest approaches, wellness trusts, and pay for success models. While these innovations are the exciting, headline-grabbing part of the Bridging for Health journey, these funding mechanisms are not enough to single handedly tackle inequities and transform population health. No amount of money can do this alone. 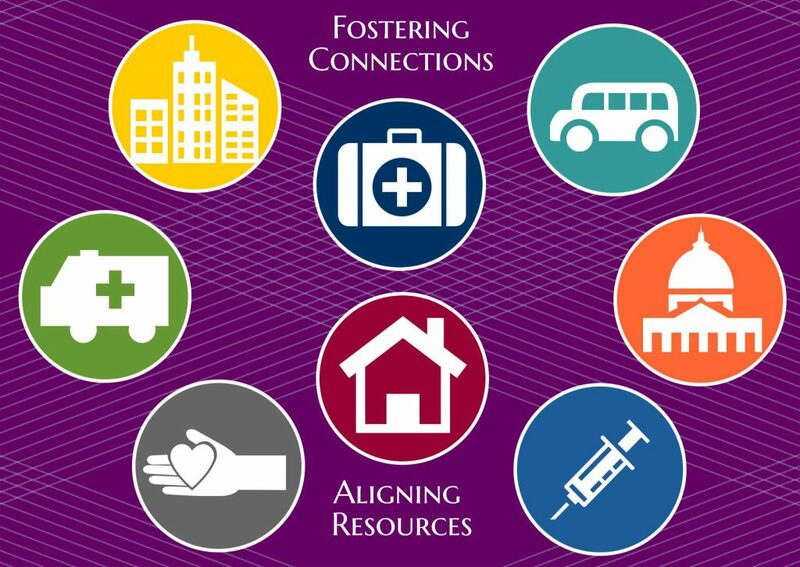 True health system transformation requires the right partners with a shared vision and sense of stewardship over the common good—the community’s health. Health Equity – While population health requires addressing factors outside of the delivery system that impact health and well-being, it is widely recognized that often these socioeconomic determinants of health are not evenly distributed in a community. This creates health disparities. Health equity refers to fairness in the way health determinants are distributed among different groups of people. While some negative determinants of health are deeply entrenched in communities, being intentional about bringing sectors together to think about how to align financing, can achieve improvements in population health for all. What’s Next for Bridging for Health? Over the next year, Bridging will be adding additional sites. If you know of an on-the-ground partnership between community development and health partners that are jointly innovating new ways to finance population health, we’d love to meet them. Please email us at bridging@gsu.edu. Also continue to follow our work and learn more about the communities online at www.ghpc.gsu.edu/bridging. 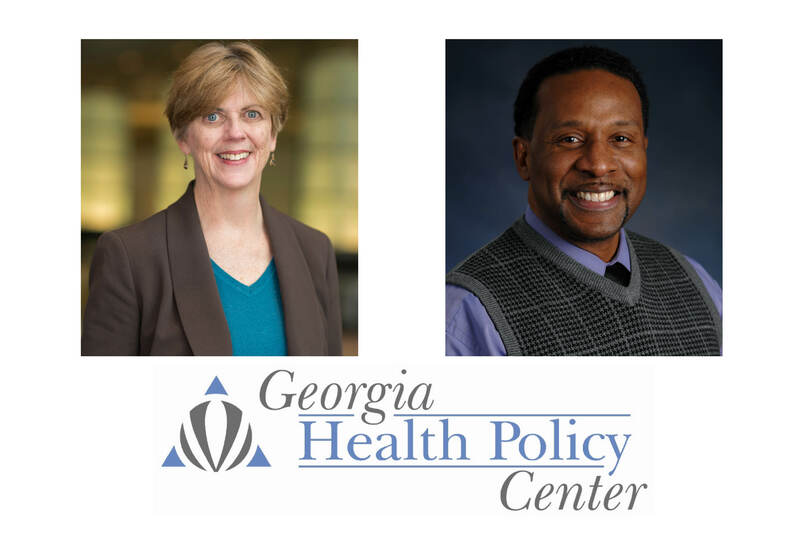 Karen Minyard, Ph.D. is director of the Georgia Health Policy Center at Georgia State University’s Andrew Young School of Policy Studies and principle investigator of Bridging for Health. Bridging for Health is a capstone of her long-standing research interests in financing and evaluation of health-related social policy programs; strategic alignment of public and private health policy on all levels; the role of local health initiatives in access and health improvement; the role of targeted external facilitation and technical assistance in improving the sustainability, efficiency, and programmatic effectiveness of non-profit health collaboratives; and public health systems financing. Chris Parker, M.B.B.S., is an associate project director at the Georgia Health Policy Center and co-principle investigator of Bridging for Health. As a trained family physician, who has worked with underserved populations and faith-based organizations, Chris brings significant personal experiences to his understanding of public health and workforce issues. He plays a pivotal role in many of the center’s projects relating to public health and program evaluation. He also provides leadership to facilitating development of a significant number of state and local organizational strategic and evaluation plans.